Nokia is having a hard time keeping its secrets lately. One of its highly-anticipated smartphones, codenamed EOS, leaked in flesh and blood, only to be leaked again and again days after. And now, we're presented with images of the said device up and running, along with a quick overview of its features. 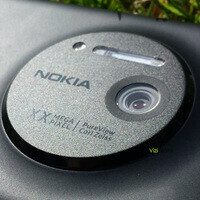 The Nokia EOS is said to have a solid feel, but it is also on the heavy side – much like the Nokia 808 PureView. It isn't clear, however, whether the handset's body is made of metal or polycarbonate. The smartphone has adopted many of its design features from other Lumia models, and the mandatory 2-stage shutter key is also present. Chances are that the screen has been given the ClearBlack treatment, judging by how clear it is to see under broad daylight. No specs are revealed by the source of the photos, but if rumors are to be trusted, the Nokia EOS comes with a 1280 by 768 pixel OLED display, 32GB of storage, and the same 41MP camera found on the 808 PureView. It should run Windows Phone 8 at launch with the GDR2 pre-installed, along with other goodies by Nokia. Among the will be a camera application giving the user total control over the snapper – something that both amateur and professional photography enthusiasts will surely appreciate. The source of the images you see below promises to post screenshots of the Nokia EOS interface and software, along with photo samples taken with its camera. These should come soon enough. Your lagaxy zoom can't compete this phone! even the galaxy camera was beaten by the 808 pureview. Stop getting jealous you retarded! Nokia has the best camera so far! Now keep crying. Yep Nokia has the best camera but most people would prefer SMARTphones with a good camera than a camera with a phone. So you are saying that this phone isn't a smartphone with a good camera? You missed the point. WP is a smartphone platform, in case you forgot. So, to break it down for you: Nokia EOS with the best camera + WP = Best Smartphone with the Best Camera. Best of Both Worlds. Bezel is not that thick. Look at the point where xbox and photos tiles meet. That's to avoid accidental presses. The alternative is to use physical keys. Its the same size as the 920's bezels. In real life the bezels on the 920 aren't nearly as big as the online pics make them seem. That's actually true. However, if you ever read the reviews of the HTC Windows Phone 8X, you'll understand why. The reviewers kept missing the capacitive buttons, and their thumbs reached the outside frame of the phone. A pretty obvious explanation. I actually agree with you dude that is a bloody big bezel! That's not a huge bezel, that's a gorgeous "Lumia style" bezel! This is Lumia. Thanks for your opinion. Now stop writing "This is Lumia." at the bottom of every comment. I don't get it, if "This is Lumia" sound annoying to you, then why you didn't complain about donjunior's "Samsung FTW"? It's hard to argue rationally if you're a Samsung or Apple fan. I'm not anyone's fan. I love every manufacturer. And please explain that why you didn't complain about donjunior's "Samsung FTW"? Dude, I just told you that. I didn't say YOU are Samsung/Apple fan. I said I didn't complain about donjunior's "Samsung FTW" because it's hard to reason with blind fanboys. Sorry for any confusion. Okay then, sorry about that. Huge? I don't think so. These bezels represents the style of lumia!